The ShareCenter™ 2-Bay Cloud Network Storage Enclosure (DNS-320LW) is a Network Attached Storage (NAS) device with mydlink™ Cloud Services, backup and media features that make it ideal for storing and sharing photos, music, movies and work files on a home or business network. The ShareCenter™ 2-Bay Cloud Network Storage Enclosure is the perfect home solution to share, stream, manage and back up all of your digital files by creating your own personal Cloud. Remotely connecting to your ShareCenter™ cannot be easies, simply download the free mydlink™ Access-NAS mobile app. The NAS mobile app, allows you to access your files and stream music, video and photo content to your smartphone or tablet from anywhere around the world. Plus, the simple and intuitive hardware design lets you easily add up to two 3.5” SATA hard drives to your device without the use of any tools, making the ShareCenter™ a powerful, scalable solution for your home or office. The DNS-320LW includes smart library applications that allows you to organise your music and photos effortlessly. Experience the full benefits of managing your files with the built-in applications such as My Music, My Files, My Photos and P2P downloads. You can manage your P2P downloads, view your photos, stream music, access your files, either within your home network or remotely via mydlink™, whereas My Surveillance allows you to record and manage videos from mydlink™ cloud cameras. This enclosure supports 2” internal SATA HDDs up to 4TB capacity and installing them is as simple as popping the top and sliding them in. Push the latch button to access the drive bays, then just slide your drives into place and you’re ready. A convenient USB port on the back of the ShareCenter™ can be used to either share a USB printer with an entire home or office, or attach an external USB storage drive for easy one-touch backup. You can also connect an Uninterruptible Power Supply (UPS) to monitor power levels and ensure the safety of your data in the event of a power failure. Plus, you can copy the contents of a USB dongle at the touch of a button. Four different hard drive configuration modes are available (Standard, JBOD, RAID 0, RAID 1), which allow users to choose the configuration best suited to their needs. Standard mode creates two separately accessible hard drives. JBOD combines both drives to create a single, easy to use volume. 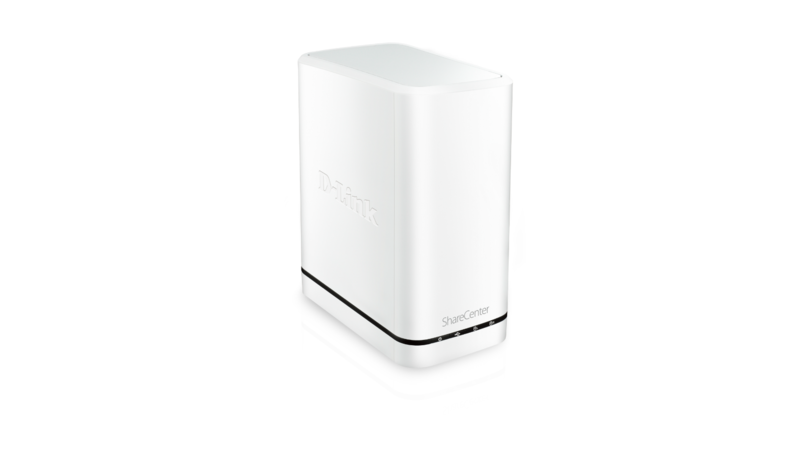 RAID 0 combines both drives in a “striped” configuration, which provides maximum performance when using a Gigabit Ethernet connection. RAID 1 creates a copy of your data on both drives, providing maximum protection; if one drive fails, the unaffected drive continues to function as a single drive until the failed drive is replaced. The DNS-320LW is hot-swap enabled meaning you can easily replace a failed drive and your data will automatically be copied to the new drive, allowing the ShareCenter™ to return to its full level of protection and ensuring your files remain safe. Storage Utility for Mac Latest Storage Utility for Mac can be found on our Mydlink website. Storage Utility for Windows Latest Storage Utility for Windows can be found on our Mydlink website.